One of the fascinating and interesting aspects of Badaga [both people & language] is the free use of delightful but deep meaning proverbs called “ DODDARU SHLOKA”. When you engage an elderly Badaga into any conversation, you are sure to hear a lot of these proverbs thrown in to make / emphasis a point. Prof. Paul Hockings, probably the most authentic researcher on and of Badaga lists more than a thousand Badaga proverbs, 1730 to be precise. May be he had extensively borrowed these from the unpublished manuscript of M.K.Bellie Gowder. He feels that 1730 could be a complete figure containing all the proverbs . 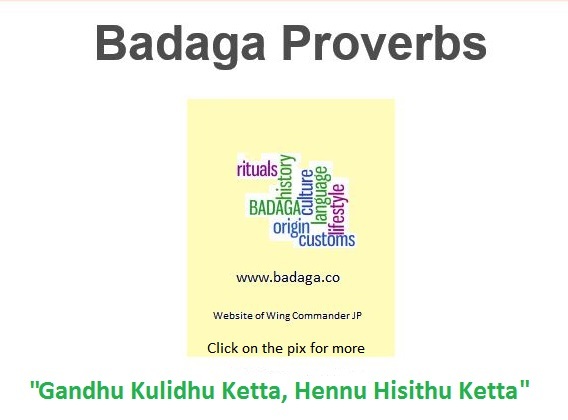 See his book,’Counsel from the Ancients: Study of Badaga Proverbs, Prayers, Omens and Curses’. He has given the meaning in English as well thus making it easy to understand in a beautiful manner. Though I find his collection extremely interesting and educative, I do not agree with some of the conclusions he draws on certain proverbs. For example, on the proverb, ‘Odhidhama Niddhana, Oddidhama Erandina’ . Prof.Hockings interpretation is quite different to what I feel is the correct meaning. I think ‘a person who spends time learning and pondering (over a problem) is better than the one who runs away (in a hurry) and thus trips over. [Odhidhama – learned one , Niddhana – stops to ponder over[think] a problem, Oddidhama – one who runs away or is in a hurry, Erandina – trips over. It is common practice for Badaga mothers to tell their young children ‘Oda beda , Erandiray’ – Donot run, you will trip over (a stone or any obstruction). That is ‘ do not be in a hurry and take a hasty decision’. Another one is ‘Michidhavaga Morande Kolu Bangara’. The lady who does not listen to her husband /any one (Michidha Hemmathi) is bound to land up as a widow (when ‘Morande Kolu – a small stick of morende tree – replaces her jewellery [bangara] – nose ring and ear rings during the Ole Kattuva ritual of husband’s death / funeral ceremony). Prof.Hockings feels Mechidhavaga (see the difference between michidhava – one who does not listen- and mechidhava – one who is appreciated by all – even a morende kolu is enough as jewellery. Is it a case of beautiful wordplay (pun) by our ancestors?? I have listed a few of the proverbs below and hope to add more in future. Really good proverbs Kindly keep posting more. Please add some more proverbs. I am so crazy about it. I am proud to be a Badaga, I love Badaga language and culture. Exellent proverbs here. 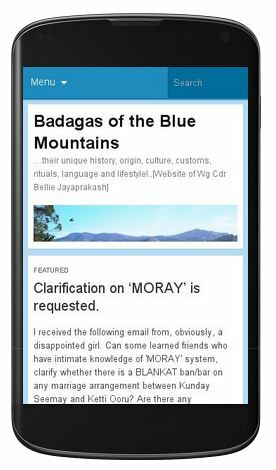 i am really touched by this website and first and foremost i should salute to those who designed this… as badaga people we need to contribute something to our community and should take some initiativeness to grow more so that, we help our younger generation to know about our traditional culture and values…. Really fascinated with the collections u have about badagas. Its the one stop treasure for all badagas. Can we include more badaga songs ? By the way , I will get u the Photo of Mr.L.Krsihnan the great singer fropm Thangadu. badagas are working in various places in the world … proud of our community and if we work hard our community will became an record in the world level,we are the only people in india not getting any dowry. I am really thankful to all those people to design an web site for us, we are the best hospitality people in the world,I like badaga and nakku betta. As Ravi anna has rightly written , it is customary for many of us to visit the site and discover something new … and catch up with the updates in the site.. it is very true…in my case. My name is Sujan joghee. You are excellent however could you please remove hettay amma history because you are doing a great job and please donot publish that because you are publishing the hidden history of (known) 667 years of my mom ok. This a REQUEST to you Please. DONOT PUBLISH THAT.ok? Amazing!!!!! My search for badaga proverbs really ended here…Cheers!! !